The submitted widget will be displayed with the tag [fireworks]. 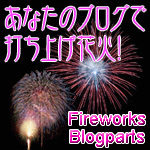 Watch a beautiful display of fireworks right on you blog. Scroll down the widget's webpage to find the correct code.